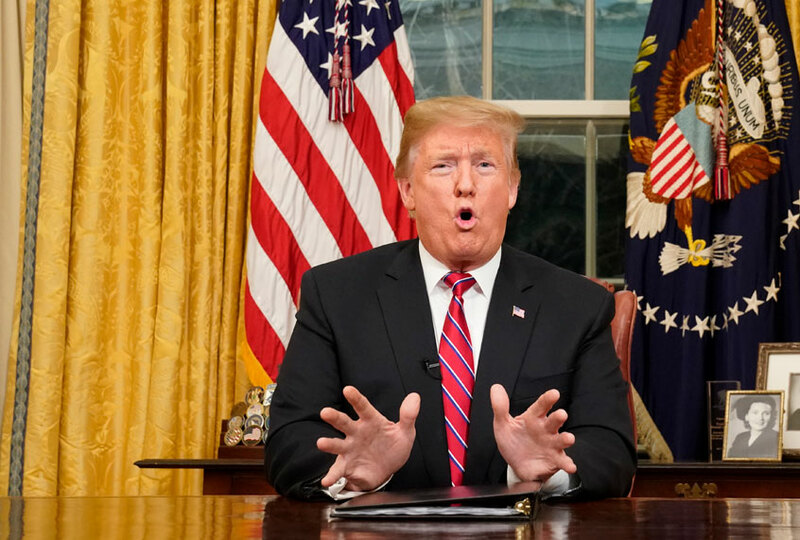 All the major networks and cable news channels decided to give Donald Trump eight minutes of uninterrupted airtime to justify shutting down the government as blackmail to get his border wall. This was, needless to say, a controversial decision. While network leadership offered lame excuses, responsible journalists pointed out that giving a known liar a massive audience to spin his racist lies without the threat of fact-checking was a violation of everything journalism is meant to stand for. Unsurprisingly, that did not happen, which was too bad, because, as predicted, Trump’s speech — reportedly written by his slimy aide Stephen Miller — was a densely packed suitcase of lies. Miller’s lurid racism was all over the speech, which focused heavily on the grotesque details of crimes committed by a few undocumented immigrants, ignoring the fact that native-born Americans commit crime at higher rates. Trump openly conflated the refugees seeking legal political asylum at the border with “illegal” immigrants, an overt lie that paints an entire group of people as criminal based on their ethnic background. He lied about the effect immigrants have on the economy, blaming them for lower wages and lost job opportunities. But, of course, unemployment is at a record low, something Trump is happy to talk about when he’s not trying to whip Americans into a racist frenzy. Trump’s speech relied heavily on the drug war to make the case for the wall, with the president openly suggesting that the wall would somehow pay for itself by fully eliminating most if not all of the social costs of drug abuse. That’s a particularly brutal lie, as most drugs that are smuggled in go through legal ports of entry that will remain open no matter how tall Trump’s wall is, or whether it’s made of steel or concrete or a big pile of cash-saving trash. Perhaps the ugliest lie was Trump’s half-hearted effort to pretend to feel compassion for the women and children who cross the border seeking political asylum. He weakly claimed that his administration was somehow trying to prevent the violence families encounter on the journey and claimed he was open to offering more humanitarian aid — though he made sure to be clear that he fully intended to kick as many of these people out as possible, making even this bad faith attempt to appear compassionate laughable on its face. In other words, the speech was exactly as bad as critics said it would be: Packed full of lies and almost stunningly grotesque in its racism and its dehumanizing portrayal of immigrants who clearly only offend Trump by not being white enough in his eyes. Senate Minority Leader Chuck Schumer and House Speaker Nancy Pelosi were offered an opportunity for their own rebuttal, but this was far from enough to make up for the horrible decision to let Trump lie unimpeded. To be certain, Schumer and Pelosi did as good a job as could be hoped for. Unlike Trump, they were honest and forthright in their arguments, and tried to clarify that refugees are no threat and border walls don’t keep drugs out. For anyone who actually knows the facts of this situation — the number of undocumented immigrants has been declining for a decade, and the migrants seeking asylum have a legal right to do so and are being artificially slowed down by the government, and Republicans also don’t want a border wall or they would have funded it in the past two years — it was obvious that Schumer and Pelosi had the right of this exchange. Unfortunately, there was no way for viewers who didn’t know much about this issue coming into the evening to know the difference. Trump’s lies were presented alongside Schumer and Pelosi’s truths as statements on the same footing. It would be impossible for a viewer to distinguish facts from lies, outside of pre-existing notions of which party and which politicians are more honest. The effect of this is to simply frame “truth” as a matter of whose opinion you like better. If you prefer to believe Trump’s claims that the nation is under assault from huge bands of marauding and murderous immigrants, then so be it. There was no real-time information for viewers trying to distinguish the truth of the differing claims. While some journalists — such as Rachel Maddow and Chris Hayes at MSNBC — did try before and after the speeches to give some useful facts, the grim truth that most viewers tune out after the “important” speeches are done. The only saving grace here is that Trump is such a flagrant, frequent and notorious liar that many viewers may be inoculated from believing his ghastly, violent and racist fantasies. Sure, his much-ballyhooed base will believe him. They’d believe Trump if he told them he farts gold and his doctor told him he is immortal. But the concern here is whether millions of Americans will be bamboozled by the trappings of the Oval Office into believing Trump’s fantasy that they are about to be viciously murdered at any minutes by the savages pouring in over the border. Let’s hope not. But the wild irresponsibility of the networks in letting Trump spread lies and defame innocent people on TV without limits has put us into a dangerous situation. This kind of “big lie” rhetoric has been known to work in the past, in circumstances I probably don’t need to mention. Until we get some polling data we won’t know for sure whether Americans have been fooled again, this time by a man whose racist rhetoric is edging ever closer to all-out eliminationism.